Is there anything more Australian than the local show? The smell of freshly slashed grass, cow manure and donuts, the drone of blowflies and incomprehensible directions over the loudspeaker, the jewel-like colours of the jam display - and the tension between rivals vying for those coveted trophies! 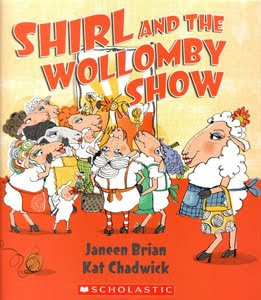 Shirl and the Wollomby Show was written by Janeen Brian, illustrated by Kat Chadwick and published by Omnibus (Scholastic), 2010. It's a children's picture book that's such fun to read and share with kids! There are features that both adults and kids will love, and I predict you'll be laughing aloud just like me. It's Wollomby Show time again, and Shirl and the other girls in the paddock want to join in the fun. Trouble is, Gertrude the goat always wins the prizes for cooking and flower arranging-and everything else. How will they even out the contest? Brian has chosen a rollicking rhythm and rhyming text that make a perfect introduction to poetry and bush ballads for children. Younger kids will enjoy the story and hope for the smug Gertrude's downfall; older kids will appreciate the finer details of fun internal rhymes and Aussie ingenuity. Chadwick's art work is priceless. It really captures the country show and complements Brian's humour beautifully. The sheep are individuals whose character comes through in their eyeshadow, elaborate hairstyles and personalized aprons. Shirl and the Wollomby Show would make a great acquisition for schools with units on Australian Studies. It would also be perfect as an introduction to poetry for kids - I can just see students learning to knit, make pickles, jams and cakes, and putting on their own mini show in the playground. This looks like a great book to use in the states to teach kids about different cultures, it would be fun to have them compare the two cultures this way. That's a great idea, Kelly! And then they could have a go at creating their own picture books that show an aspect of either culture.